Nestled under fifty-year-old trees at a playground at Freeman Elementary, now lies artificial turf that was stored at the Astrodome after being used at NRG Stadium for college and high school football games. 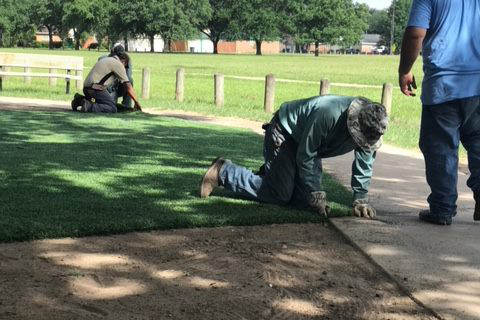 Two rolls of Astroturf, weighing over six tons, were recently delivered directly from NRG Park and installed as part of a beautification project at Freeman. According to Principal Mike Van Loenen, the area around the playground was just dirt and tree roots due to the established trees not letting grass grow. He researched ways to beautify and improve the playground when he had an idea while watching the news one night. “I saw rolls of Astroturf being stored at the Astrodome on the news and I thought, what are they going to do with all the turf?” said Van Loenen. Van Loenen then reached out to Judge Ed Emmett and Commissioner Jack Morman via email, who facilitated the delivery of 6,000 square feet of artificial turf. He worked with the PISD Maintenance Department and a group of youth volunteers from the Evangelical Lutheran Church in America (ECLA) Youth Gathering to install the turf at the playground.